This absolutely stunning beachfront Penthouse overlooks the golden sands and crystal blue waters of Vallarta’s famed south shore. The open floor plan features a gourmet kitchen with granite counters, custom cabinets and bar seating under custom pendant lighting. The elegant and tasteful living room with spectacular vaulted ceiling and gorgeous indoor dining open to the beautiful covered outdoor terrace overlooking the beach, bay and town! The spacious bedrooms are havens of restful relaxation that take full advantage of the stunning views and include private bathrooms and separate air conditioning zones. 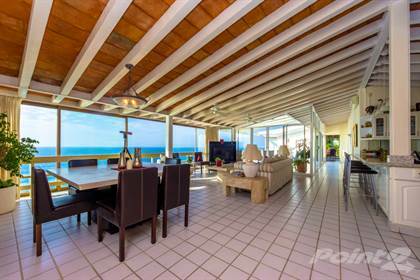 Some other features of this beautiful beachfront home include: remodeled kitchen and bathrooms, new plumbing, wiring, “mini-split” air conditioning, private storage locker and wood beamed ceilings. The well maintained complex includes: Secured entry, professional management, laundry and storage room and lovely pool surrounded by tropical gardens. This beautiful beachfront home would be perfect for a second home, retirement villa or investment property. Elegantly furnished and offered "turn-key" ready, this amazing beachfront home is perfect for the most sophisticated and discriminating buyer. Hi, I'd like to find out more information about Solamar PH 91. Thanks so much!